The White House on Tuesday met with a small group of Jewish leaders as part of an intensifying effort to press for a delay in new Iran sanctions it fears could derail negotiations with Iran on a possible nuclear deal. 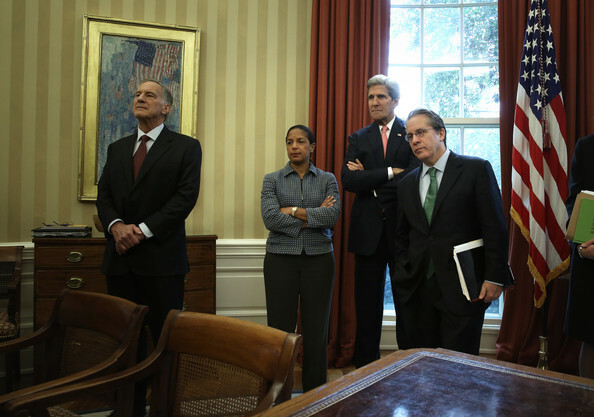 National Security Advisor Susan Rice, Under Secretary of State Wendy Sherman, Deputy National Security Advisors Antony Blinken and Ben Rhodes briefed leaders from the Jewish groups on the Iran negotiations to date. Participants in the off record discussion, which was first reported by JTA, included leaders of the Conference of Presidents of Major American Jewish Organizations, the Anti-Defamation League, American Jewish Committee, and AIPAC, the statement said. The Obama administration has been waging a more vigorous effort to try to push back against new Iran sanctions legislation under consideration by the Senate Banking committee, arguing there should be a pause in new sanctions through the fall, while maintaining existing major oil and banking sanctions, to give momentum to negotiations and test if Iran is serious about making a nuclear compromise. The administration wants a “pause” on new sanctions until January to try to come to closure on a possible confidence building measure, and they feel new sanctions now could derail that effort, sources briefed on the discussions said. As part of that effort, Treasury Secretary Jack Lew and Sherman, the lead US negotiator, have been doing classified briefings on the Hill this week, sources said. Lew and Secretary of State John Kerry are due to brief Senators on Iran in closed session on Thursday. Israeli Prime Minister Benjamin Netanyahu has recently argued that the only acceptable deal with Iran is one that would permit no enrichment and zero centrifuges. Current and former American officials and even some former Israeli officials contend that a zero enrichment deal is unachievable, and wonder if Netanyahu intends to try to spoil a possible deal that could increase the amount of time it would take for Iran to have potential nuclear breakout capability. A good if imperfect negotiated solution is superior to the alternative options available, former top State Department Iran nonproliferation official Robert Einhorn argued in a paper delivered in Israel last week, noting increased pressure from the US now could fracture the international community and push Iran to escalate by increasing its enrichment activities. The Obama administration is asking Congress to delay new economic sanctions on Iran in order to give momentum to negotiations on a possible nuclear compromise. “We think that this is a time for a pause [in new sanctions], to see if these negotiations can gain traction,” Under Secretary of State Wendy Sherman told the Voice of America Persian Service in an interview Friday. Three White House officials—Jake Sullivan, national security advisor to Vice President Joe Biden, Phil Gordon, the National Security Staff Coordinator for the Middle East and the Persian Gulf, and NSS Senior Director for Persian Gulf Affairs Puneet Talwar – met with aides to Senate leaders on Thursday to press for a delay in new Iran sanctions legislation being considered by the Senate Banking Committee, a Senate staffer said. Sherman also briefed House leaders earlier this week on her negotiations with Iran and other members of the P5+1 in Geneva last week. Diplomats from Iran and the P5+1 are due to hold another round of negotiations in Geneva November 7-8. Technical talks involving nuclear and sanctions experts from Iran and the P5+1 will be held in Vienna October 30-31, the office of European Union foreign policy chief Catherine Ashton said Friday. The US team to the technical talks in Vienna will include Sherman’s deputy and top advisor on arms control issues James Timbie, State Department deputy Iran sanctions official Richard Nephew, who previously served at the NSC and Energy Department; and Treasury Department sanctions office chief Adam Szubin, US officials told Al-Monitor. (Meantime, State Department Iran sanctions czar Daniel Fried was in Europe this week for consultations with European counterparts on the EU sanctions regime.) Iran’s delegation to the Vienna talks will be led by Hamid Baidinejad, the Iran Foreign Ministry director of political and international development, Nasim reported, adding that the Iranian team will include legal, nuclear, technical and economic experts. Israeli diplomats, in Washington for consultations this week, urged their US counterparts to press for a deal that would dismantle as much as possible of Iran’s nuclear infrastructure, including its entire domestic enrichment program. They also pressed for no let-up in existing sanctions for nuclear concessions that Iran might agree to make in an interim deal, including suspending 20% enrichment. “Nuclear energy without enrichment is the only reasonable compromise,” Israeli Intelligence Minister Yuval Steinitz told Al-Monitor Tuesday. Iran is entitled to “civilian nuclear energy. …The only request, is that they buy nuclear fuel from” abroad. Iranian diplomats told their P5+1 counterparts at meetings in Geneva this month that they would be willing to discuss various elements of Iran’s nuclear program to find a compromise to address international concerns, but did not offer a very concrete, detailed proposal, several diplomats said. The P5+1 have asked Iran to bring a more concrete proposal to the next meetings, the diplomatic sources said. Sherman, in her VOA interview, also seemed to express regret for her comments at a Senate hearing last month that deception is in the Iranian DNA. Israeli Intelligence Minister Yuval Steinitz said Tuesday that he believes Iran is “serious” about wanting to make a nuclear deal to save its economy. But he pressed for no let-up in economic pressure unless Iran agrees to terms for a deal that many US national security experts believe could preclude a diplomatic compromise. “Nuclear energy without enrichment is the only reasonable compromise,” he said. Steinitz was in Washington leading an Israeli delegation attending two days of high-level talks with US counterparts as part of the US-Israel Strategic Dialogue. US Deputy Secretary of State Bill Burns and Under Secretary of State Wendy Sherman addressed the gathering Wednesday, the State Department said. Sherman led the US delegation to P5+1 talks with Iran in Geneva last week in which the Iranians “were saying they are ready to discuss” various elements of a potential nuclear compromise, Steinitz said. Though their proposal was not very detailed, Steinitz said he understood, he said he did not interpret that necessarily as a sign of lack of seriousness. “I am not pessimistic,” Steinitz said. Iran's economic problems have brought Iranian leaders to realize they have a “dilemma,” he said. “If it’s put to them, ‘Look, the time to maneuver… is over. After ten years of negotiations… enough is enough. You have to make a decision. You want to save the Iranian economy? You have to give up your military nuclear project on all its components. You choose to continue with your military nuclear program? You will destroy the Iranian economy,” or face possible military action. Steinitz, in the interview, argued against any sort of interim deal that might offer Iran an easing of sanctions in exchange for nuclear concessions. The concern, he said, is that once any sanctions are eased, the entire sanctions regime will crumble, and won’t be able to be ramped back up if Iran backslides on the agreement. 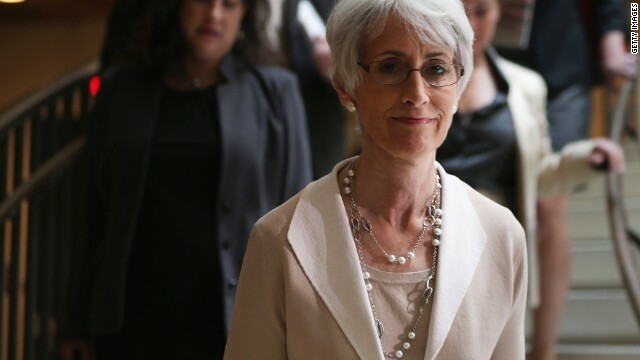 Lead U.S. Iran negotiator, Under Secretary of State Wendy Sherman, is expected to brief Congressional leaders and relevant committee chiefs in classified session this week on the talks between six world powers and Iran held in Geneva last week. In a brief conversation last week that did not delve into the details of the Iranian proposal, Sherman told House Foreign Affairs Committee ranking Democrat Eliot Engel “that the Iranians appeared serious,” but cautioned that the “devil’s in the details and made clear that the US negotiators will remain clear eyed as they seek to negotiate a deal to end Iran’s nuclear weapons program,” Engel said in a statement. Diplomats from the six world powers and Iran have agreed not to publicize the details of the Iranian proposal presented in two days of talks in Geneva last week (Oct. 15-16). Iran's deputy nuclear negotiators for the first time met with their US counterparts one on one for an hour in Geneva, and conducted the negotiations with their P5+1 counterparts in English, facilitating the pace and candor of the negotiations, western diplomats said. But western diplomats were cautious in characterizing their reaction to the undisclosed Iranian proposal, describing a deal as still likely some ways off. Geneva__ Western and Iranian diplomats hailed a new pace, candor and mutual will to try to forge a process to resolve international concerns about Iran’s nuclear program, but acknowledged they were at the beginning of a still complex and difficult negotiation whose success is not guaranteed. “The good news, we are getting to a place where one can imagine we could possibly have a process that could lead to an agreement,” a senior US administration official, speaking not for attribution, told journalists Wednesday at the end of two days of nuclear negotiations here, the first since the June election of Iranian President Hassan Rouhani. Zarif, at the Geneva talks, “presented an outline of a plan as a proposed basis for negotiations, which is being carefully considered” by the six world powers, Catherine Ashton, European Union foreign policy chief, told a press conference here Wednesday, part of a rare joint statement by Iran and the so-called P5+1. The two sides agreed to meet again in Geneva Nov. 7-8, and said that technical experts on both the nuclear and sanctions issues would be meeting before that. The US official suggested that it would probably be premature for P5+1 foreign ministers and US Secretary of State John Kerry to lead delegations to the next Geneva meeting in just three weeks time, given that there are still so many complex technical, and more fundamental, issues to resolve. The new Iranian leadership had previously expressed the conviction that progress could be made more quickly at the ministerial level. But Zarif on Wednesday struck a diplomatic tone, expressing satisfaction with how the negotiations had been conducted here, often by deputies, and said foreign ministers could be summoned when needed. The two sides also agreed not to publicly disclose the details of the Iranian proposal, given the sensitivity of the issues involved, both in Iran and foreign capitals. One party not at the talks that is unlikely to patiently await the details to be worked out before moving forward with new sanctions is Congress. The senior US official said she would be probably be briefing members behind closed doors in classified session upon her return. Zarif conducted his press conference Wednesdsy, speaking in both fluent English and Persian, from a wheel chair, having traveled to Geneva with severe back pain, accompanied by a doctor. The American official said many of the diplomats here, fellow veterans of constant air travel and chronic back pain, had expressed their empathy to Zarif and recommended to him various remedies. Geneva__ Nuclear negotiators from Iran and six world powers will hold follow on talks here in Geneva Nov. 7-8, European Union foreign policy chief Catherine Ashton announced here Wednesday at the conclusion of two days of what she called very intensive, substantive and forward-looking talks. During two days of “substantive and forward looking negotiations,” Ashton said in a rare joint statement by the six powes and Iran, Iranian Foreign Minister Mohammad Javad “Zarif presented the outline of a plan as a proposed basis for negotiotians which are being carefully considered by” the six powers. The parties have agreed not to disclose the details of the Iranian proposal, both negotiators said. “We sense that members of the 3+3 also have exhibited the necessary political will in order to move the process forward and now we have to get to the details,” Zarif, speaking in English, told journalists at a press conference at the conclusion of talks. “The details require serious and in depth negotiations,” Zarif said, adding they will be doing the negotiations in the negotiating room and not through the press. Iran would like the next meeting to be held at the foreign minister level, a western diplomat told al-Monitor Tuesday. Diplomats from the P5+1 and Iran are wrapping up two days of talks here during which Iran presented a nuclear proposal that western officials called ‘very useful’ and detailed. The parties will meet “in a couple weeks in Geneva to give the P5+1 enough time to come with a response” to the nuclear proposal that Iran presented here this week, Iran’s Foreign Minister Mohammad Javad Zarif wrote on his Facebook page Wednesday. “As I have said before, the negotiations are going to be difficult and will require a lot of time and focus,” he continued, writing in Persian. “You cannot have the expectation that without trust [the parties] will be able to reach an understanding in one meeting,” even one conducted in a positive atmosphere. “As had been expected, Under Secretary [Wendy] Sherman and members of the US delegation held a bilateral meeting with Iranian Deputy Foreign Minister [Abbas] Araqchi and members of the Iranian delegation tonight, as the Iranians are doing with a number of delegations during these talks,” a senior State Department official said. Deputy Iranian negotiator Abbas Araghchi told Al-Monitor late Tuesday that the meeting with the Americans was good, and helped them further clarify positions. Iran's deputy foreign minister for European and American Affairs, Majid Takht Ravanchi, speaking briefly to Al-Monitor after the talks Tuesday, described the bilateral meeting with the Americans as 'no big deal,' and 'useful.' Ravanchi, who said he was educated in Lawrence, Kansas, before the 1979 Islamic Revolution, told Al-Monitor that after the meeting with the Americans, the Iranians held a bilateral meeting with the Russians. Iran's Fars News first reported the two teams were set to meet shortly. An Iranian official, asked about the report, confirmed it, saying the Iran side in the meeting with the Americans was led by deputy foreign minister Araghchi. US Secretary of State John Kerry met for thirty minutes with Iran's Foreign Minister Mohammad Javad Zarif in New York last month. Noting the meeting, and the historic phone call between Iranian President Hassan Rouhani and President Obama, a senior U.S. Administration official told journalists Monday that “rubicon” had been crossed. “This is a direct consequence of Rouhani and Obama breaking the taboo,” Ali Vaez, senior Iran analyst at the International Crisis Group, said of the US-Iranian meeting here Tuesday. Western officials praised Iran's presentation of its nuclear proposal to six world powers Tuesday as 'very useful' and very detailed, but have so far relayed few of its contents. Talks are due to continue here on Wednesday. Diplomatic sources suggested there was likely to be a follow on meeting in Geneva in a couple weeks. The Iranians would like Kerry and other Foreign Ministers to attend, and he would like to, sources said. Geneva_ Iran presented a nuclear proposal to six world powers here today, which western diplomats unusually praised as “very useful” and detailed. “We heard a presentation this morning from Foreign Minister Zarif. It was very useful,” Mann said earlier Tuesday. For the first time, the meeting between the P5+1 and Iran was being conducted in English. “We presented the general contours of our proposal and will present the details in the afternoon session,” Abbas Araghchi, Iran’s deputy foreign minister and deputy negotiator, told journalists in Persian here after the morning session ended. “The meeting was very positive,” Araghchi, responding to a question in English, characterized the morning meeting. He also told Iranian media that Iran’s proposal will remain confidential until an agreement is reached. The talks got started at the city’s Palais des Nations at 10AM local time, with the morning session ending just before noon. The full group went back into talks around 2:45PM, with the Iranian team led by Araghchi, and wrapped up around 5PM. Zarif and Ashton were to meet Tuesday evening, and other bilateral meetings were also thought to be occurring. “This meeting is not about the details, it is about discussing the broad contours of an endgame and the roadmap for getting there,” said Ali Vaez, senior Iran analyst for the Intermational Crisis Group, who is attending the talks here in Geneva. An Iranian official told Al-Monitor Tuesday that he doesn’t know yet if the Iranian team will hold direct talks with the Americans here in Geneva, but did not rule it out. “It’s possible,” he said. Araghchi met with Russia’s Deputy Foreign Minister Sergei Ryabkov Tuesday morning, Iranian journalist Mojtaba Mousavi reported. Two U.S. government sanctions experts were expected to attend the afternoon session, Araghchi also said. Iran’s lead negotiator, Foreign Minister Zarif, presented at the talks this morning, after having dinner with European Union foreign policy chief Catherine Ashton last night. Zarif was also scheduled to have dinner Tuesday night with the Swiss Foreign Minister. Zarif came to Geneva with continued severe back pain. He was photographed on his plane from Tehran laying horizontally to deal with back pain, and is reportedly accompanied by a doctor on the trip here. Both the Iranian and American delegatiions are staying at the same Geneva Hotel, as well as several European delegations. This post has been updated throughout the day with additional reporting. Geneva_ Western diplomats said they were looking forward to hear the Iranian nuclear proposal but sought to lower expectations for any immediate breakthrough at Iran nuclear talks due to get underway here Tuesday. “The chances of agreement being reached over the next two days is quite low-it’s quite complicated work, but if we can move forward actions that match tones and words,” that would be positive, the offiicial said. Iran did not share its proposal with the P5+1 in advance of the talks, western diplomats said Monday–perhaps one reason for a cautioning on expectations for how much agreement can be achieved here this week. Iran’s Foreign Minister Mohammad Javad Zarif and his team had dinner with chief nuclear negotiator, European Union foreign policy chief Catherine Ashton, at the Iranian ambassador’s residence here Monday night. Zarif did not present her the offer there, an Ashton aide told Al-Monitor. Zarif is expected to present the Iranian proposal to diplomats from six world powers Tuesday morning at 9:30am. The talks are expected to continue through Wednesday. International negotiatorss are looking for the Iranian proposal to address three core issues, the US official said. “We will be looking for specific steps on specific core issues, including on the pace and scope of its enrichment program; the transparency of its overall nuclear program; and its stockpiles of enriched uranium,” the U.S. official said.